PAIR OF AMPHIBIAN FOOTPRINTS - PERMIAN FRANCE. PAIR OF AMPHIBIAN FOOTPRINTS - PERMIAN, FRANCE. Square block of brown siltstone. On the upper surface are two footprints of an Amphibian. Clearly shows 5 toes on each footprint. 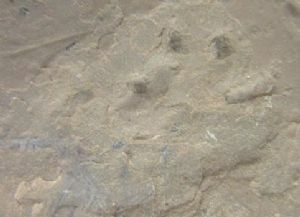 The footprints are at right angles to each other so are likely to be from two different individuals or could be the same animal wandering around. Le Bosc, Dept. (34), France. Matrix : 12 x 9 x 3 cm.